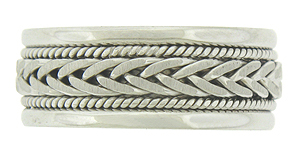 This handcrafted 14K white gold modern mens wedding band features a central braid framed on either side by slim twisting ropes. 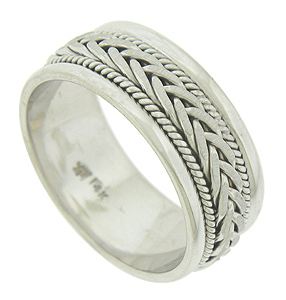 A matte finish to the central braid gives added depth to the design. The wedding ring is finished with smoothly polished edges. The ring measures 8.77 mm in width. Size 9 3/4. We cannot re-size, but we can reorder in any size. Also available in 18K, yellow gold, platinum and palladium. Prices vary depending on metal and size. Contact us for current market cost.